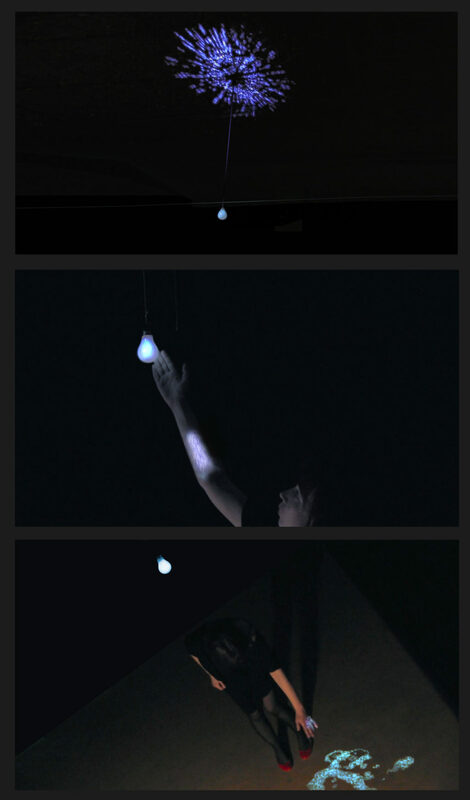 “ENTROPY” is an interactive and immersive data manifestation embedded in a projection mapping installation which corresponds to the concept of production, emission, and consumption of heat (and thus energy) in “ordered” and “un-ordered” manner (referring to the definition of the entropy phenomenon). It involves real time data visualizations taken from a number of hacked data sources, aimed to be provided in such a way so that viewers can have an intimate, tangible, and tactile relation/interaction with something as abstract as data. As such it also explores data (as real time feeds) as an independent force making the artwork alive. By playing with the installation, viewers become carriers of the “energy” data due to the projections casted onto their bodies. The “energy” then can be transmitted between one person and another, as well as it is spilled onto the environment. The rendered visualizations depend on the real time global energy spending values as well as the local temperature created by environment and number of viewers. “ENTROPY” plays mixing what is perceived as “digital” and “virtual” making it tangible in “analogue” and “real” space. Thus the installation questions issues of production and consumption of energy, its emission and transmission, and the human relation to a concept of energy on global and very intimate level. Kasia Molga is a media artist whose practice is concerned with changes in our perception and relationship with the planet in the increasingly technologically mediated world. She deals with real time environment (and not only) data visualization ­ where the data becomes a pretext, motor and platform behind the work. She look at the various aspects of real time data manifestation and representation, so that first of all it can be represented not as just an infographic, but as a mean of communication of the entities it is taken from, thus giving a beginning to a dialogue between viewer and that entity. She does that by making interactive, participatory art installations, where a viewer is responsible for his/her own experience and thus the experience of others, while the existence of the art installation depends on the real time data feeds and signals, and real time data forms the behavior of the viewer. In her work she reaches out to networked, geo­locative and sensory technologies in order to explore diverse aspects of transmitting, visualizing and sharing real time data whilst striving to promote the appropriation of new technologies within the disciplines of art and science. She has exhibited among others: Ars Electronica 2012 (Linz, Austria), TRANSNATURAL (NL), Meta.Morf (NO), ISEA (Istanbul, Turkey), Translife Media Arts Triennial (Beijing, China), MIS (Sao Paulo, BR), Dutch Design Week (NL), MOMA (NY). Erik Overmeire is a media artist working with robotics and virtual intelligence that expand into the physical realm, machine­human­interaction. He connects his screen­based work with his work in physical world, so that the line between virtual and physical reality disappears. He explore the area of the machine as an extension of a human ­ a space and no­space between man and machine ­ and as a separate conscious being and the tensions between the two. He places this blurred space between human and machine in context and perspective and thus question an expansion of human perception and relation with the machine, and machine with a human. He often writes and applies code for generative visuals and sound, vision systems, feedback loop interaction and that way he plays with the concept of primitive form of consciousness and self­consciousness. In his work he utilizes and hacks tools such as openCV, wide arrays of electronics (arduinos, environmental sensors), Kinect camera which then he innovatively applies into his artworks.